Lucille’s Pumpkin Roll is about the best thing I have ever tasted. I met Lucille Nestler in 1988 when I started my career at the Hearing Loss Association of America. Lucille was a weekly volunteer. Some might call her a “little old lady.” Little, yes. Old, hardly. She would be considered a senior, but she was not a little old lady. Lucille wore hearing aids and missed a lot of what you said, but she would beam a disarming smile and kindly ask you to repeat. Lucille was sprightly and positive. Her husband died when their only son was young and she decided that she would raise her son doing things her husband would have done with him. She taught him to fish, hike, and how to catch pollywogs. She knew she couldn’t fill the shoes of a dad, but she would do her best so he wouldn’t miss out on certain things. The result was an enduring and close relationship with her son, his wife and her grandchildren. She also loved to bake. Her regular treats brought to the office were crispy peanut butter cookies, chocolate chip cookies, applesauce cake and, on special occasions, her pumpkin roll. She never installed air-conditioning in her Washington, D.C., area home where the temps soar and the humidity swealters. Yet, she continued to bake and bring goodies to the office weekly, year round. She would apologize when she didn’t have time to do so. This year I ran across her neatly-typed recipe she gave me for her pumpkin roll. It would be part of this year’s feast. But one thing I needed to know…could I make it ahead of time and freeze it? I had to know because the dessert had to cooperate with this year’s “Do-Ahead Thanksgiving” which I will write about when I wrap up all the short entries. I don’t know where Lucille is, but she must be around 90. I wanted so much to be able to call her and ask her advice about freezing her pumpkin roll and catch up. Fond memories flooded my thoughts. As the song goes, you picked a fine time to leave me, Lucille. Preheat oven to 375 degrees. Grease a cookie sheet. (1” sides, 10 x 15) and cover with wax paper. Grease again. Mix all of the above ingredients and pour into pan. Bake 10-15 minutes until center springs back. Lay a tea towel (not terry) on table and sprinkle with granulated sugar. Flip cake on towel and peel off paper. Roll pumpkin in the towel and let it cool for several hours. 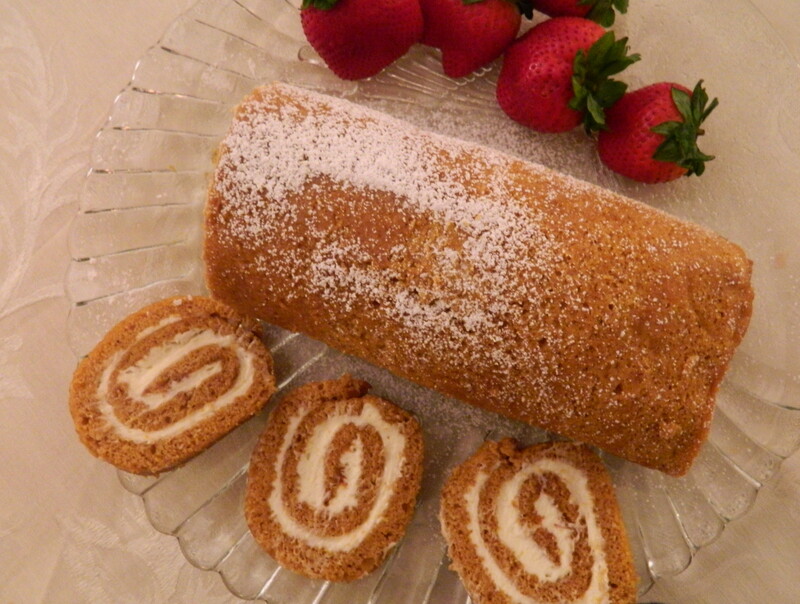 Spread cream cheese filling onto baked pumpkin cake and roll up. Combine ingredients. Unroll pumpkin loaf and spread with filling. Roll up again. Wrap in wax paper and then in foil. Refrigerate. Slice when ready to serve. Note: I took a leap of faith and froze the Lucille’s Pumpkin Roll. It freezes beautifully. This entry was posted in Baking, Christmas, Cooking, Family, Food, Food Photography, Holiday, Hospitality, Party, Thanksgiving and tagged Cream cheese pumpkin roll, Food Photography, holiday desserts, Lucille Nestler, Nikon Coolpix L120, pumpkin, Thanksgiving dessert by Barbara Garneau Kelley. Bookmark the permalink. Love this article! Lucille is 92 and lives with her son, his wife (me) and her granddaughter. She has a wonderful daughter and son-in-law in NC, a grandson and his wife and 2 greatgtands in CO. She can no longer walk, or remember how to use words, but her smile hasn’t changed! Thank you so much for this wonderful story!! Hi, I’m Lucille’s granddaughter. I found this blog by doing a Google search on Nana. I thought I’d update on my mom’s, Sunny, post. Nana passed away in January of this year. At my parents’ home. And holding my Dad’s hand. Her memory of us, where she was, maybe even who she was, faded in and out. But she always had that smile on her face! I’m glad you posted this to share a part of her! Thank you! 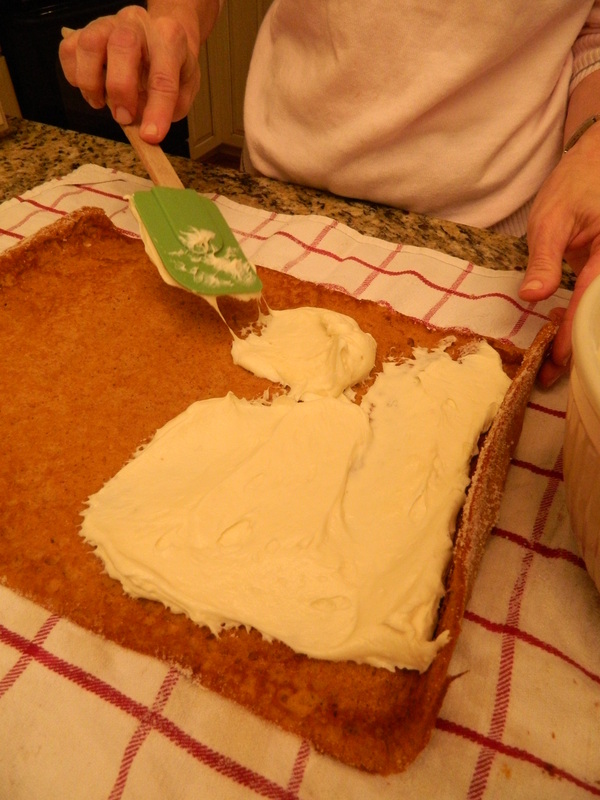 Your Nana was one of my favorite people and each time I make her pumpkin roll I lovingly think of her. I will let those who knew and loved her know this news. I know she loved you all and lived life joyfully to the end.